15.03.18 – Formby, Liverpool, UK. 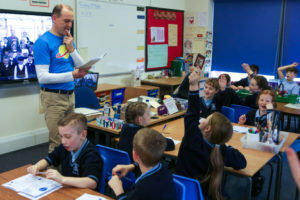 TSB chief executive Paul Pester running a workshop hosted by TSB at St Luke’s CE Primary School in Formby. On Thursday 15 March 2018, TSB CEO Dr Paul Pester and space scientist Dr Maggie Aderin-Pocock visited St Luke’s Church of England primary school in Formby, Liverpool to help bring the wonders of the universe to life for 60 Year 5 pupils. The class spent the day designing rockets getting set for lift-off on a top secret mission to colonise Mars. 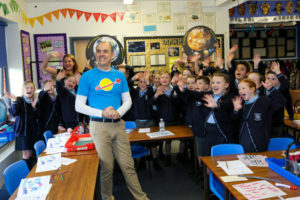 The workshop – Let’s Build a Rocket – is the result of a collaboration between Professor Stephen Hawking’s daughter Lucy Hawking, TSB and Curved House Kids – a company specialising in educational materials for young people. Specifically aimed at Key Stage 2 students, the workshop sees students become space explorers who design a rocket for their journey into space. Incorporating maths, science and art, the initiative has been designed to encourage more children to engage with STEM subjects and to demonstrate the value and impact that numeracy and technology skills can have. Paul Pester, Chief Executive Officer of TSB said: “Stephen Hawking has always been a huge inspiration to me. He was instrumental in fuelling my lifelong love for maths and physics, and it was a real honour to meet him just a couple of years ago. TSB chief executive Paul Pester during a workshop hosted by TSB at St Luke’s CE Primary School in Formby. to have the same opportunity to explore the universe as I have had and, even more importantly, see how STEM subjects will give them the foundation to go anywhere and do anything they want to in later life. “I know first-hand how STEM subjects are the backbone to how we live our lives. Physics gives you a broad understanding of the world you live in and helps you develop key skills, from problem-solving to being analytical. 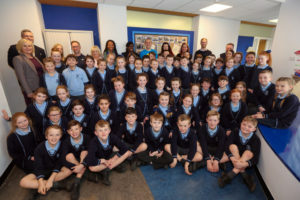 Mrs Jenny Harper, Year 5 teacher at St Luke’s C of E Primary School commented: “I really couldn’t believe it when I received a phone call to say that our school had won TSB’s Let’s Build a Rocket competition. STEM is of paramount importance to us at our school and it was amazing recognition of all the work we do day in, day out. “And what a day it was on Thursday – amazing from start to finish. All of Key Stage 2 were completely and utterly inspired by the assembly, led by Dr Paul and Dr Maggie – making us realise that if we dream big, work hard and try our best, our dreams can come true, no matter what hurdles are placed in our way. A workshop hosted by TSB at St Luke’s CE Primary School in Formby.